Few nations, if any, can boast the historic splendour of Ethiopia, evidence of whose extraordinary past is everywhere, from its rock-hewn churches, still places of living worship, to its ancient historical traditions and magnificent cultures. 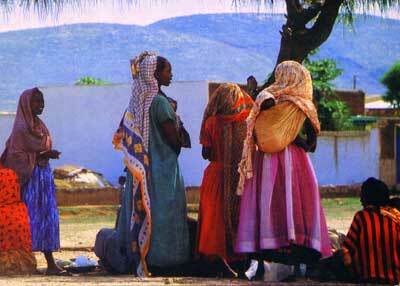 Ethiopia, is a nation of surprises, full of diversity and contrast, from the ancient to the modern. Legend has it that Emperor Menelik I, the son of the Queen of Sheba and king Solomon, brought the Ark of the Covenant from Jerusalem to Axum, where he settled and established one of the world’s longest known, uninterrupted monarchical dynasties. This is only one example of Ethiopia’s magnificent history, which encompasses legend and tradition, mystery and fact, from a powerful and religious ancient civilization. The well -trodden path through Ethiopia’s famous and fascinating historic places takes you through a scenically magnificent world of fairy -tale names, such as Lalibela, Gondar, Deber Damo and Bahar Dar. With a population of more than two million people, Addis Ababa is not only the political capital but also the economic and social nerve-centre of Ethiopia. Founded by Emperor Menilek in 1887, this big, sprawling, hospitable city still bears the stamp of his exuberant personality. 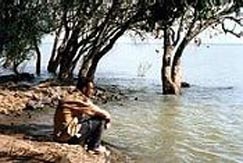 more than 21,000 hectares in area, Addis Ababa is situated in the foothills of the 3,000 meters Entoto mountains and rambles pleasantly across many wooded hillsides and gullies cut through with fast-flowing streams. 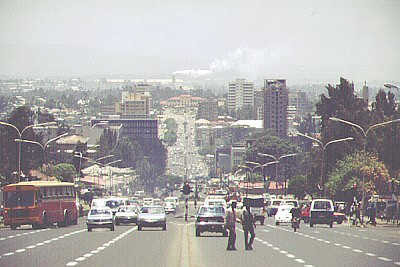 Like any other capital in the world, there is more than enough for anybody to do in Addis. There are numerous restaurants offering various exotic dishes from many parts of the world. Ethiopian food is served at the majority and there are Chinese, Italian, Indian, Armenian, Arabic, Greek and many other specialist restaurants. Indeed, it is possible to eat your way round the world without ever leaving Addis Ababa. on the entertainment side several cinemas show international films with English dialogue or sub-titles. Most of these cinemas also stage dramas in Amharic depicting Ethiopia’s social and cultural life during different historical epochs. Shopping in Addis is a delight and the shops are fairly well stocked with almost all consumer goods. The local jewellery, sold by the weight of gold or silver, is in particularly high demand .The main market-known as the Mercato, is largest open market place in Africa and has a wonderful range of goods and products, items of local art and Ethiopian curios and antiques. Here, haggling over prices is expected - and one should allow ample time for this, At the shops in town, however, prices are fixed, although a small discount is often allowed on large purchases. 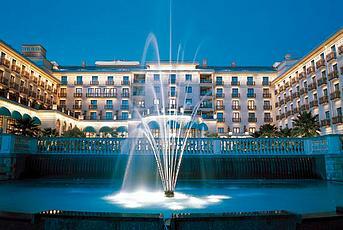 If you have some spare time during your stay there are a number of places that are well worth a visit. The Addis Ababa university, whose campus occupies a palace built by Haile Selassie before the Italian occupation of Ethiopia, houses the Institute of Ethiopian studies and the Ethnological museum. 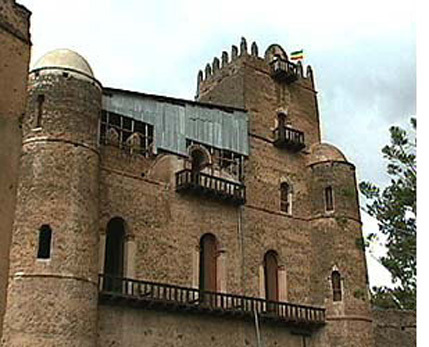 The St George Cathedral was built in 1896 in the traditional octagonal shape in commemoration of Ethiopia’s military success at the Battle of Adwa (St George is the patron saint of the soldier) and houses modern paintings by master Artist Afework Tekle, an Ethiopian painter whose work has won wide international recognition. 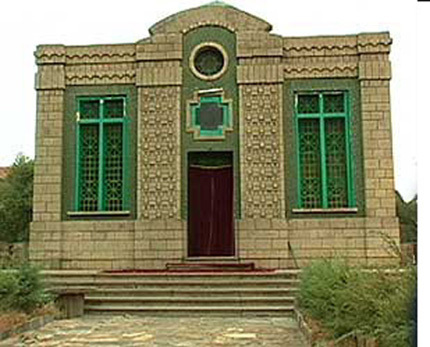 The Menilek mausoleum was built in 1911 and the Trinity Cathedral in 1941, Both serve as tombs of emperors, princes and Ethiopian martyrs of freedom. Menilek’s wife, Taitu, and his daughter, Zewditu, are also entombed at the mausoleum. Halfway by road to Axum from Addis Ababa, you will pass, 1,005 kilometers to the south, Ras Dashen, which, at 4, 543 meters, is Africa’s fourth -highest mountain. Axum, the northernmost stop along the route, is the site of Ethiopia’s most ancient city and is renowned for its Cathedral of St. Mary of Zion, where, as legend has it the original Ark of the Covenant is housed. 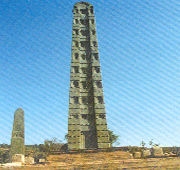 Axum is also famous for its seven mysterious monolithic stelae, all made of single pieces of granite and with identical decorations. The biggest of them is 33 meters high and weighs over 500 tones. It was the largest monolith in the world but fell at some time in the past. 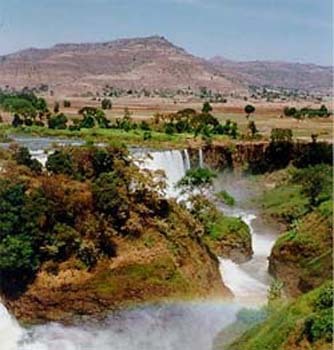 Bahar Dar, the next stop, is 578 kilometers from Addis Ababa, has daily Ethiopian Airlines flights and a number of good hotels, and is located on he southern shores of Lake Tana, the source of the Blue Nile, with its ancient island monasteries and both the Blue and the white Nile’s most spectacular feature, the Tis Isat waterfalls. On the island of Dega Estefanos, you will find the church of Saint Stefanos, which has a priceless collection of icons and manuscripts and houses the mummified remains of a number of Ethiopian emperors. 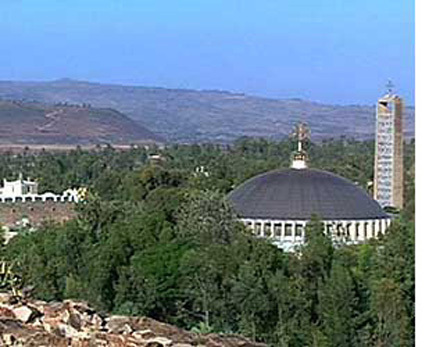 Some 76 Kilometers from Axum is the monastery of Debre Damo (closed to Women), which is said to have the oldest existing intact church in Ethiopia. 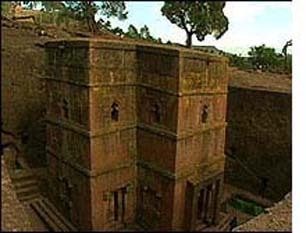 Local tradition says that Abune Aregawi, one of the nine Saints, built the church in the 16th Century. 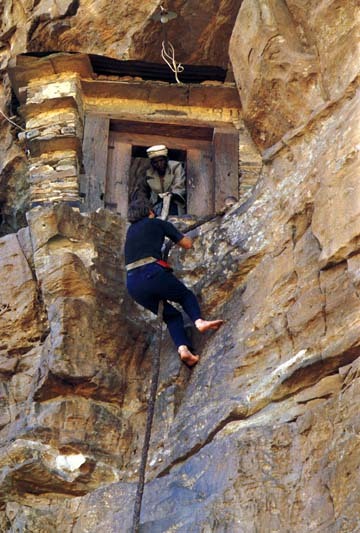 The Monastery of Debre Damo can only be reached by rope pulley. Taking the historic route north from Addis Ababa, the first stop is Deber Markos, 305 kilometers north of the capital and also accessible by air three times a week with Ethiopian Airlines. Here you will find the 19th Century church of Markos (saint mark), with its pale but beautiful paintings depicting scenes of biblical and religious history. 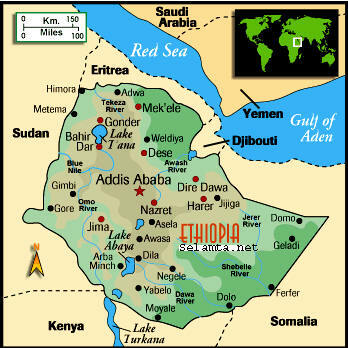 Gondar lies 748 kilometers along the route from the capital and is also served daily by Ethiopian Airlines. The town has some good hotels. 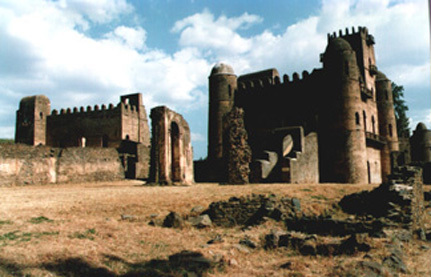 The oldest and most impressive of Gondar’s many imperial structures is the palace of Emperor Fasiladas, said to have been built by an Indian architect. There are also numerous other fascinating historical buildings and relics to be seen in the area. 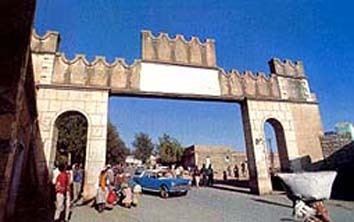 Off the oval- shaped, almost north- south historical route, is Harar, 523 kilometers due east of Addis Ababa. While the town has a reasonable hotel, most people prefer to stay in Dire Dawa, 54 kilometers away along the road to Addis Ababa. The most dominant features of Harar are its strong encircling walls, which tightly embrace the town, its rich and exciting market place probably the most colorful in Ethiopia and its 99 Muslim mosques, which make this the fourth most holy city of Islam. The last stop the route is Lalibela, 642 kilometers from the capital, with good hotels and with daily Ethiopian Airlines flights. 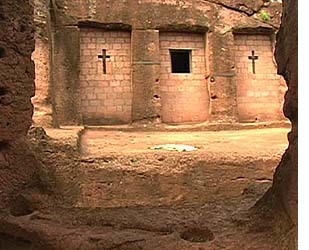 Though not much more than a village, Lalibela is internationally renowned for its rock -hewn churches, which are sometimes called the eighth wonder of the world. Carved out of the rock in which they stand, these towering edifices seem to be of superhuman creation in scale, workmanship and concept. 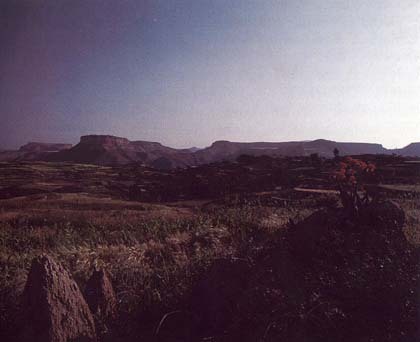 Although Lalibela is unique, it is not the sole site of Ethiopia's famous rock-hewn churches. 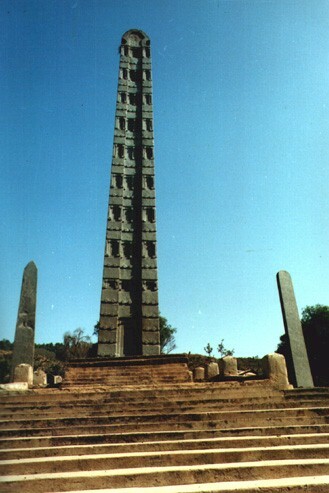 In Tigray near Mekelle, over 200 fine example of these monuments to man's devotion to God as well as his building skills, may be seen and visited. 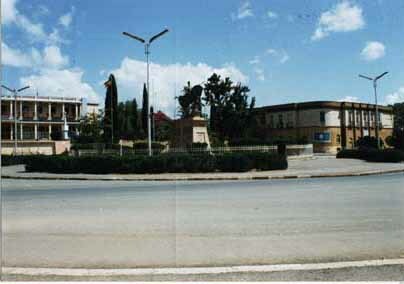 The Capital of the Emperor Yohannnes IV (1871 - 1889), Mekelle is now the main town of Tigray, the most northern Ethiopian region. The Emperor's palace has been turned into a particular interesting museum, with many exhibits of his time and subsequent history. The town is also well known as a transit point for the Camel Caravans bringing salt up from the arid lands of the Danakil Depression. This makes the market palace a particular interesting place to visit. 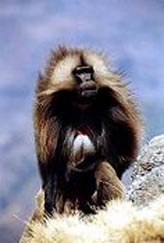 Intrepid visitors can also make excursions into the Danakil to visit some of the Afar nomads that trek across the region.